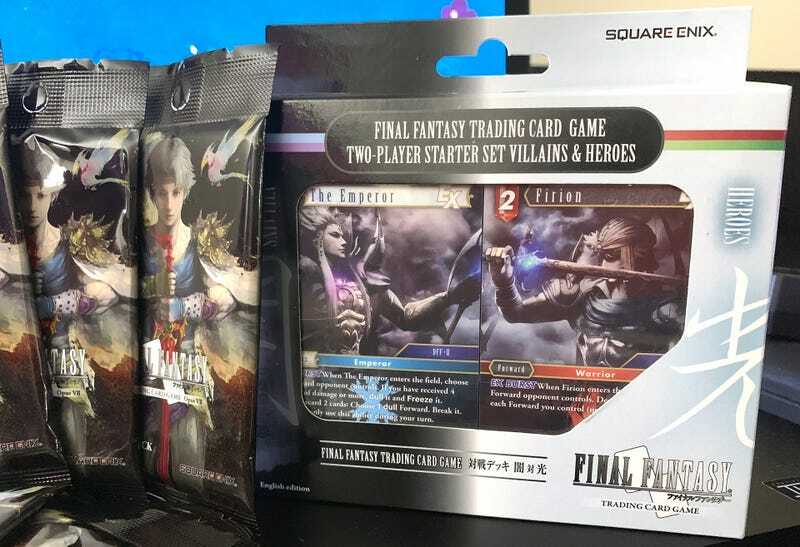 After two years of purchasing booster packs simply to admire the gorgeous art of Square Enix’s Final Fantasy Trading Card Game, I’m finally ready to play, thanks to the incredibly handy “Villains & Heroes” two-player starter set. While my main motivation for gathering Final Fantasy TCG cards is to sniff the ink and lovingly stroke the textured card backs before slipping them into a sleeved binder to cherish forever, I’ve felt a bit bad about never really using them for their intended purpose. It’s about time I figured out what the numbers on these tiny works of art do. These are the contents of one of the recently-released Opus VII booster packs. The Villains & Heroes two-player starter set comes with a pair of pre-constructed 50 card decks, which are themed appropriately to the name on the box. The hero deck features some of my personal favorite cards, including Fat Chocobo, Vivi and the brilliant Y’shtola. There are multiple copies of each card in the decks, because it works. Meanwhile, on the villain side of things, we’ve got Genesis, Amon, Ultimecia and the Shadow Lord. Those are some outstanding cards for new players to get their hands on first thing. Also included in the set is a handy dandy set of instructions that’s perfectly simple and easy to understand. See? You could almost learn how to play just by looking at this image. Oh wait, there’s another side. Yeah, it’s still a bit complicated. but don’t let the two pages fool you, it’s not too bad. My wife and I managed to figure it out. We even got the game all set up and started putting down cards before the kids started trying to steal them. Maybe wait until the kids are asleep. There are other ways to get into the Final Fantasy Trading Card Game. Hit up a local TCG store when they’re having an event. Grab a couple of the single-player pre-made decks. Just keep picking up booster packs, like the newly-released Opus VII set, and hope for the best. Opus VII adds cards from Final Fantasy Crystal Chronicles: Ring of Fates, Final Fantasy Legends and Final Fantasy Brave Exvius. But if you have a partner in mind and want to hit the ground running, the Villains & Heroes set is the way to go, as long as they haven’t all been bought up by players trying to get extra Vivi, Genesis, Amon and the Shadow Lord cards.